When you think of a “heater” you’re probably thinking of a furnace. That’s because furnaces are incredibly common across the country. Just because this system is more common, doesn’t mean that it’s always better. If you’re looking for comfortable and efficient heating then consider a boiler for your home. Boilers utilize “radiant heating.” Radiant heating uses a network of in-floor piping to distribute heat throughout your home. This network of pipes radiates heat from a boiler to warm the people and objects in a room instead of the air surrounding your home. Boilers are beneficial because they’re more energy-efficient than other systems and they’re more comfortable. People who have boilers in their home often say that they prefer the feeling of this type of heating because it mimics the feeling of the sun shining down on you on a hot day rather than feeling hot air blowing through your home. Boiler systems are also great because radiant heating uses less energy than forced-air heating. 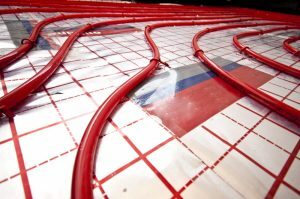 Radiant heating systems absorb heat faster and hold it for much longer. These systems also last much longer than other systems because they have fewer moving parts than the average forced-air heating system. Although boilers are great, they aren’t infallible, so if you think you need boiler repair services but you’re unsure be sure to reference the list below. Low Boiler Pressure: Feel like things are a little off when it comes to your boiler’s functionality? Check your boilers built-in pressure gauge. If the pressure is low then you’re having trouble with your heater. Make sure to contact our team sooner than later to rectify the issues. Odd Noises: When a boiler is going south you might hear banging, whistling, or gurgling noises coming from your heating system. If this is the case, then it’s a great idea to contact a heating professional. A noisy boiler is always a sign of a problem. Thermostat Issues: If your thermostat is inaccurate then it’s a sign that you need repair services. This could either be an issue that’s solely referring to the thermostat in your home or it can be an issue that affects your radiant heating system overall. The only way to know for certain is through the assistance of a trained professional. If you’re considering upgrading your heating here in Vancouver, then make sure that you contact Area Heating & Cooling, Inc. today to schedule an appointment with our team.